Paranormal Research in Time of Trump: Beware! Four out of 5 white evangelical Christians voted for Donald Trump. Although a majority of people identifying themselves as “Christian” did not vote for him, he has embraced the white evangelical Christian interpretation of the Bible. And that interpretation does not favor a belief in the paranormal. According to a 2005 Gallup Poll, 3 out of 4 Americans believe in one or more aspects of the paranormal, which is defined as a “psychic or mental phenomena outside the range of normal.” Phenomena may include believing in ghosts, angels, Bigfoot, aliens, etc. Simply put, the paranormal is the unexplained. And the spectrum is vast. The Bible includes a lot of unexplainable mysteries. By definition, these mysteries fall within the spectrum of the paranormal. However, most televangelists rebuke this. They claim the Bible does not approve of the paranormal. They can’t identify precise passages. (There aren’t any) Often they take lines out of context hoping not to be challenged. Likewise, a lot of their followers disapprove of the paranormal. They are vocal in their condemnation. To them the “paranormal” is un-American. Unfortunately, these televangelists have Trump’s ear. Enter Newton Leroy “Newt” Gingrich, former Speaker of the House of Representatives from Cobb County, Georgia. Back in June, Newt declared that legislators should dust off the House Un-American Activities Committee (HUAC) by re-instating the anti-free expression committee to root out “radical Islam.” When Newt was not selected as Mr. Trump’s running mate, he backed off his stance until now. Newt reenvisions a modern form of the committee. Now he wants a committee formed to roundup people who oppose the viewpoints of Trump. And let’s face it: Trump gets his viewpoints from those around him—namely millionaire televangelists. Newt’s comments beckon back to the day of governmental censorship and McCarthyism. The House Un-American Activities Committee (HUAC) was established by the US House of Representatives in 1938 to monitor communist behavior in Americans. Building off of the anti-communist sentiment after World War II, HUAC hit its stride in the 1950s by abusing its subpoena power and ability to blacklist people whom the committee members felt were communist sympathizers. Those summoned before the committee who exercised their Constitutional rights were stripped of those very rights. People lost their jobs, reputations, and property on the whims of committee members. HUAC’s most vocal proponent was Senator Joseph McCarthy, hence the nickname “McCarthyism.” It was a dark time in US history. To be clear: the HUAC targeted people for exercising freedom of speech, freedom of religion, and freedom of political beliefs. It was a tool to punish left-wing activism. The hypocrisy remains that the HUAC was ultimately un-American. Newt wants people to believe he is a historian. He’s not. He has a narrow viewpoint of what qualifies as “American.” Further, Trump’s vision of an “American” is predominantly Christian—white evangelical Christian. Here is where the warning comes in: Paranormal research and investigations go against the white evangelical Christian leanings of Trump and his supporters. In the Age of Trump, one should error on the side of caution, at least until we know where he stands with his un-American committee. Speaking to a standing room only audience at Scarefest 2014, Chris Dedman announced his intention to study under Bishop James Long and to become a full-fledged Demonologist. Upon completion, Dedman will join the ranks of John Zaffis and Stacey Jones. Dedman cautioned: Do not enter this field of study lightly. Included in the presentation was an authenticated audio clip from the infamous Anneliese Michel possession case. In the clip, you can hear the afflicted young adult spouting off in Latin; the intensity and enormity of the demonic possession is quite evident. It is haunting. 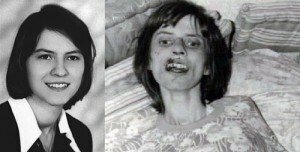 Anneliese Michel (9.21.1952-7.1.1976) was a devout Roman Catholic German high school student when she began to suffer epileptic seizures at the age of 16. She was prescribed medication; however, she began hearing voices soon after. So began the possession of Anneliese. She, her parents, and two local priests believed that she was possessed by a demon. At the age of 23, she withstood 67 exorcisms over a 10 month period. During that time, her behavior became more erratic and bizarre and her health rapidly declined. She died weighing 68 pounds and with both knees broken from continual genuflecting. Her parents and the priests were charged with negligent homicide (topic for another blog). The possession of Anneliese is the topic of three movies and thousands of Internet postings. The second case was from February 2008 and profiled on the popular paranormal series Paranormal State. “I am Six” was an unsettling case for all involved. Over 10 paranormal teams abandoned this case. Dedman reinforced the idea that teams who find themselves over their heads should call in help. The final case was Dedman’s appearance on Ghost Adventurers. The video clip depicted Dedman speaking with Zak Bagans, lead investigator, explaining a spirit box session at the infamous Ax Murder House where an entity said “Legion.” This is a term for demon and unnerved Dedman. Dedman’s humor masks the pain he suffers through his work. Once someone faces a demon, he is marked for life. Relationships suffer. Health issues arise. Lives change—and not for the better. Dedman protects himself with a blessed St. Benedict medal. He recites the “Prayer to St. Michael, the Archangel.” He uses blessed salt to protect his environs. And he always puts people first. Proceeds from his booth sales go to the Catholic Church. Dedman is a man of God doing God’s work in very dark corners. On a positive note: Dedman’s book has been picked up by a publisher and should be published in late 2015. For more information about Bishop Long’s Demonology course, please view www.demonologyclass.com. News of Robin William’s suicide rocked the Internet. Fans are still reeling from his death. Depression has been thrown into the national spotlight. But will anything substantive be done to heal them? One person dies by suicide every 16.2 minutes. According to the World Health Organization, depression became the #1 disability in the world. Between 75-80% of all completed suicides are made by men. Interestingly, there are 8 to 25 attempted suicides for every completed one. The good news: 80% of people who seek treatment for depression are treated successfully. The bad news: 15% of people who are diagnosed clinically depressed die by suicide. Depression is the strongest risk factor in suicides. First, let me offer this disclosure: I am not in the clergy; I am not an ordained minister. I am a practicing Episcopalian. Most importantly, I am a believer. And an ardent reader. There are some great articles written by many far more qualified to speak on this matter; however, I wanted present a layperson’s perspective. Call it my 2 cents. God loves all His children unconditionally. He knows that we all suffer. But He forgives us. Depression is a disease. Its effects are patient specific. Depression is a tricky beast that lies in wait for years. It may take up residence and stay for a lifetime. For the lucky, the beast may only stop in for a few years or ultimately be permanently evicted. However, without treatment, it will surely kill you. People caught in the grips of this beast don’t act logically or rationally. The bouts are just that bouts. It’s where the brain battles the beast. 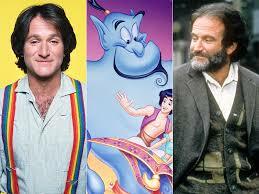 For Robin Williams, the beast won. The beast took more than a man. The beast took a comedic genius. Robin Williams was talented, quirky, creative, and one of the best humanitarian ambassadors in the industry. He will be missed. God welcomed Robin home. Robin is at peace. The beast is gone. 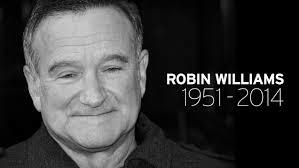 My prayers go out to Robin’s family and professional family. They need time to grieve, to heal, and to seek professional help. Don’t let the beast get you. Seek help for depression. If you know of someone who may need help, be her family and get encourage her to seek help. Note: For more information, please visit: http://www.save.org/index.cfm?fuseaction=home.viewPage&page_id=705D5DF4-055B-F1EC-3F66462866FCB4E6. Demonic possession cases are rare. However, every—and I mean EVERY—paranormal investigator needs to know how to distinguish between them and mental illness. 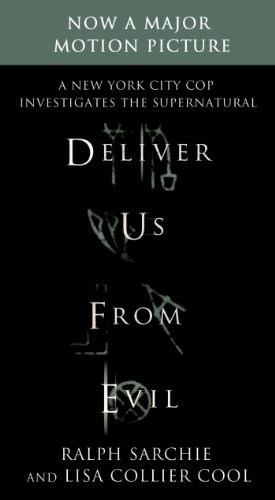 Ralph Sarchie’s Deliver Us from Evil teaches the reader to do just that. Ralph Sarchie is a veteran NYPD police officer. He is also a paranormal investigator trained by Ed and Lorraine Warren. A devout Catholic, Sarchie along with co-writer Lisa Collier Cool interweave fascinating case studies with practical advice. My copy is flagged throughout. This book dives right into an unbelievable case. The authors then step back and provide Sarchie’s backstory. The common thread linking the chapters is God. Sarchie’s a firm—and I mean firm—believer in God and the power of prayer. And I agree! 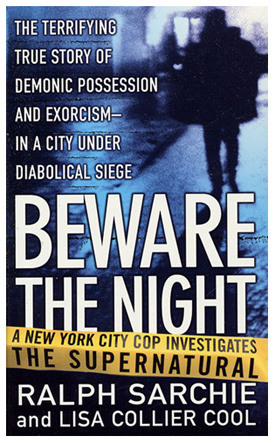 Originally published as Beware the Night. Some of the more salient points are: The psychic hours are between 9 pm and 6 am. Human spirits aren’t subject to exorcism. Inanimate objects cannot be possessed. Prayer works! However, Sarchie goes in depth with orders and stages and terminology. Hint: Read the book. The problem is that people don’t believe in the Devil. Even some of the clergy don’t believe a Devil exists. Sarchie makes a credible argument that an Unholy Trinity exists and is waging war against the Holy Trinity. His Unholy Trinity consists of Satan, Lucifer, and the Antichrist. Combined they are feeding off of innocent and uneducated souls. Only the Holy Trinity, the Father, Son, and Holy Ghost, can save them. Sarchie should know; he has assisted on countless exorcisms. He works in concert with the Catholic Church. While reading the book, I was reminded of the movie The Conjuring. I can hear Ed Warren’s voice advising Sarchie in many of the cases. Shoot, even John Zaffis make a couple appearances. This book shows why it is important for paranormal investigators to help their clients. It reminds us that somewhere along the way we will encounter a case that is beyond our capabilities. We cannot handle it alone. We should refer those few cases to the professional exorcists. Do not attempt! Unfortunately, there will be the few who will not heed my advice. The Devil and his minions do exist, my friends. It is only through God that they are controlled and casted back to Hell. 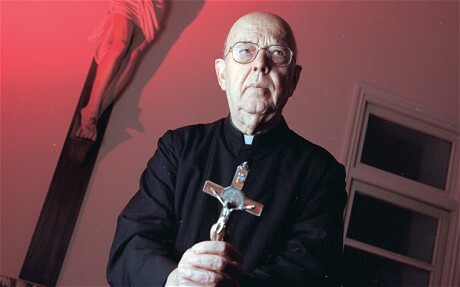 Father Gabriele Amorth, Official Exorcist of Vatican City. Interest in the paranormal has surged over the past few years. Reality TV shows propelled this popularity causing some viewers to take up arms and to start hunting ghosts. Most acquired a proper education supplemented with field study before consulting clients in the paranormal. But a small percentage did not. This faction gave themselves elusive titles like “Exorcist Investigator.” And that, my friend, is dangerous! 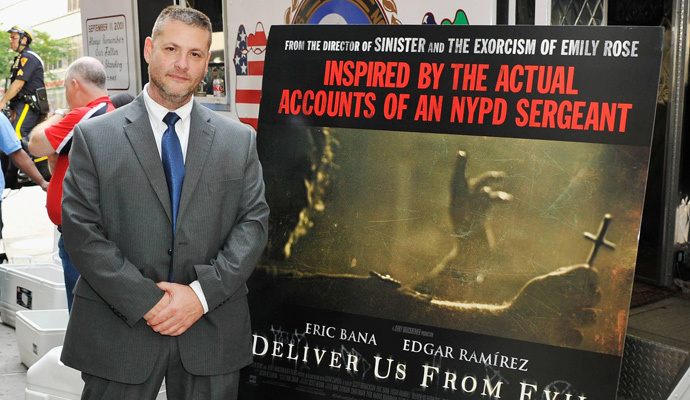 Televised “exorcisms” conducted on paranormal reality shows generate ratings. Ratings + Advertising Dollars = Series Renewals. That is ultimately the goal of all TV personalities. (Note: Legitimate TV ghost hunters do not perform exorcisms, or voodoo rituals for that matter.) All reality TV shows are 1) scripted and 2) edited for high-impact content. (See formula for explanation.) Never is unedited or uncut video footage aired. Therefore, even if you watch a televised “exorcism,” you did not see everything. Reading books does not qualify you to perform the Solemn Rite. Nor does hosting a TV show. Exorcisms can only be conducted by validly ordained clergy with permission from the church. The key word is “clergy.” You must be a member of the cloth. Priest, Reverend, Pastor. These titles are conferred upon someone who has a firm belief in God and has been trained in His word. In addition, clergy possess field experience in exorcisms. They did more than read a book. And they never practiced alone. A full-blown Catholic Exorcism takes hours to complete. The Catholic Church does not publish statistics; however, it is believed that less than ten (10) occur annually. Exorcisms are more prevalent in the Pentecostal faith, where several hundreds of “exorcism ministries” are active. These rituals are much shorter and less elaborate. Exorcisms can go terribly wrong. Quickly. Amateur exorcisms have made the headlines in recent years. A woman was pummeled to death (1995). Another was stomped to death (1997). And still another suffocated with a plastic bag (1998). Actual demonic possession is quite rare. However, it should not be taken lightly. If you suspect someone is under the Devil’s influence, refer the case. Don’t cue up the TV for guidance. This is beyond most of us. Consult fully trained people. If you’re not fully qualified, then you should never attempt! Before posting Part 2 on the Ouija Board, I wanted to take a brief interlude. An “interlude” is anything that fills time between two events. Most, if not all, paranormal investigators steer clear of Ouija Boards. Nothing good comes with their play. However, some of our clients do dabble with the game—even if they adamantly deny it. Bad things come out with the board. And only a strong firm belief in the Lord combats the evil. 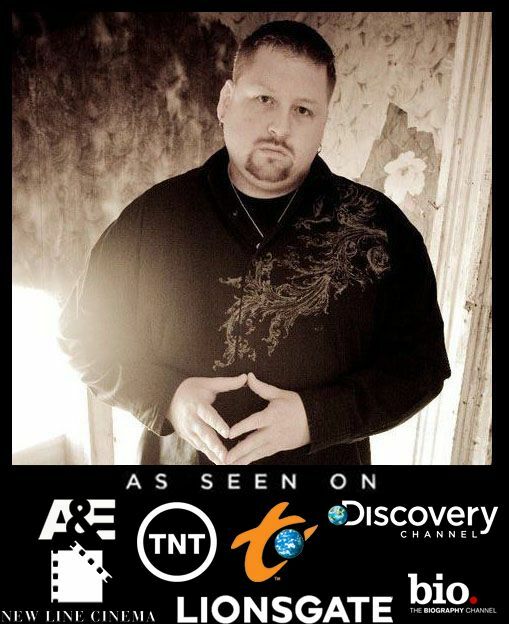 All ghost hunters need to have a firm belief in God. It is a necessity for the job. I am always cautious of people who believe in the Devil but who aren’t “religious.” You cannot have the Devil without the Lord. The universe is a balance between good and evil, light and dark, and God versus the Devil. 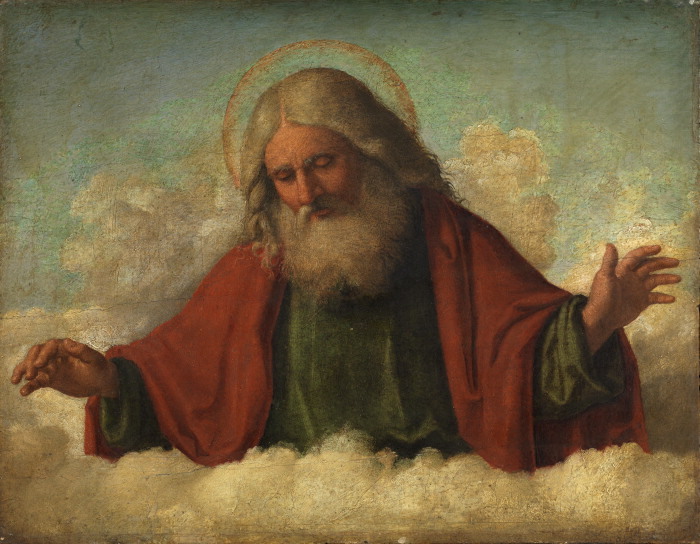 It doesn’t matter if you regularly attend church, you must believe that God is the Supreme Being. The End. But what should you be doing? You should be praying to talk with God AND meditating to hear His instructions. Prayer + Meditation = God’s instructions. The angels who look after you are directly linked to God. You don’t have to memorize the Bible. You don’t have to quote scripture. But you must believe!